So you have to have those super white movie-star teeth? Bleaching teeth as been around for a long time… A really long time. Back in the French Court of Marie Antoinette they really started loosing their heads over bleaching. Chemistry was not what it is today so they used the Urea Peroxide (pig urine) to bleach instead of Hydrogen Peroxide. Using Carbomide that has available hydrogen perioxide in a gel form, the modern tooth bleaching products have come a long way from Pig Urine… Or have they? Modern Bleaching started when dentists wanted to reduce the effects of an antibiotic called tetracycline. Back in the 1950’s this medication was given to a lot to children and resulted in turning their permanent teeth a dark grey color. Bleaching with 40% hydrogen peroxide using very controlled conditions helped but did not cure the problem. Yes side effects like tooth sensitivity, destruction of the gum tissue and in some cases Kidney Damage. It turns out that one molecule of hydrogen peroxide can kill one Kidney Cell. The only place in the body where hydrogen peroxide is broken down (metabolized) is in the mouth by an enzyme called peroxidase. Once it gets into the body watch out kidneys. Sensitivity is caused by the bleaching agent removing the calcium plugs that cover the tiny dental plup nerves that reach out to the surface of the tooth. Can you reverse the effects? after bleaching, instead remineralize the tooth with a calcium phosphate material like GC America’s MI paste to minimize the the calcium loss. Technically you could use extra sharp chedder cheese to remineralize but there will be some abrasion and possible discoloration from yellow cheese. 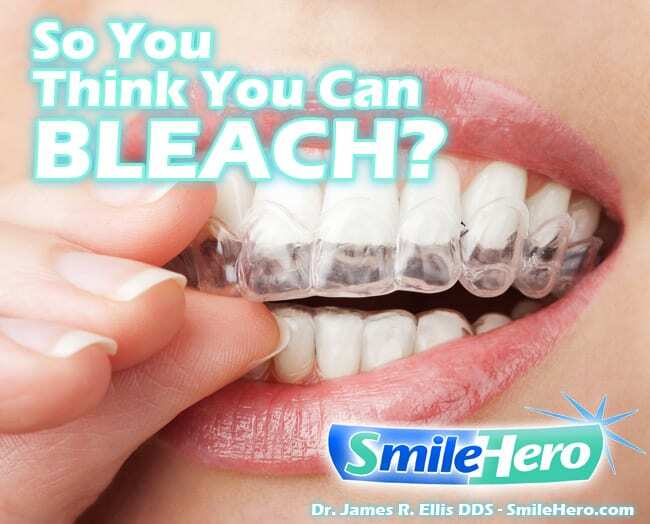 Bleaching trays when properly prepared can also help. A dentist can prepare thin bleaching trays that cover the teeth but not the gums. These cost a lot since impressions have to be taken, models prepared and then the trays vacuum formed then trimmed to the contour of the teeth. You can make your own trays using sports guards that have been formed to the teeth by dipping the material in hot water then adapting directly onto the teeth. Yes you can visualize the blisters forming on the gums from the hot plastic touching the delicate gum tissue… Ouch! A layer of serane wrap or glad wrap directly over the teeth and gums helps a little. After the well contoured trays are made, protect the gums by putting the guard in the mouth and smearing a silicone lubricant on the gums above the tray then take the tray out and apply a small amount of the bleach gel in the tray and slip the tray back into the mouth being careful not to extrude the gel out of the tray. The other product for whitening is Proctor and Gambles White Strips. They work but they take time. Any bleaching technique requires time and temperature to work. The bleach has to reach then dentine or inside part of the tooth to be effective. The only way is to get the bleach through the enamels by slowly percolating between the enamel rods from 1 to 2 millimeters. This can take a month and any day you miss bleaching will retard the percolating process. A good rule of thumb is that one day missed retards the process 3 days. If you are the do it yourself type I have included some resources that are available at local superstores or online at Amazon, Goodle or ebay. Good Luck and remember Buyer BE ware! This entry was posted by admin on March 16, 2013 at 2:03 am, and is filed under Blog. Follow any responses to this post through RSS 2.0.You can leave a response or trackback from your own site.